Devon is taking two months off from working for Clark Montgomery and I have been home for most of November so it has been a good month. Devon didn't run Art cross country last month at Chatt Hills 2* bc of the footing, so we decided to go to Poplar Place Farm and take Art and Bono. It was fun and relaxing with just the two. Art and I went out Intermediate to finish off his season. We had a respectable 3rd place finish. Devon took Bono training again, and they won the Open division on their dressage score. Nice job Hidden Creek Horses. Dan is coming back from his vacation and is happy to be back in work. Took Bono to a fabulous clinic with Francis Whittington organized by Samantha Clark of EN. The clinic was at Chatt Hills and Devon and I took the opportunity to hack Art and Dan out together. Samantha took this photo of of us along with Remi. Additional note, Devon ended up 6th Nationally on the Young Rider Intermediate Leader Board. I finished the season as 4th ranked Master Adult Amateur at Intermediate. The points were earned from one Intermediate on Monte and the rest from Art. 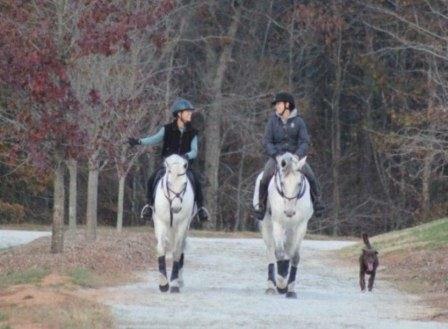 Hidden Creek Horses also would like to congratulate and thank Lanie Wright and Rebecca Goad for giving Monte a forever home in a phenomenal environment. He will live the life an a huge farm in Florida and be Lanie's partner once he is cleared to go back to work. We wish them the best. Imagine fall season in one month? That's pretty much what I did this month. It started with Intermediate at the AECs, then 2 weeks later, Art and I went on to do Poplar CIC**. It is very exciting and fun to be competing at this level. Devon will finish Art's season by taking him to Chatt Hills CCI** at the end of October as I will be back in Kstan. Devon and Dan had a fantastic start back after NAYRC by winning Poplar Intermediate. They are on headed for Fair Hill CCI** mid October. NAYRC proved to be three's a charm for Devon and Dan in 2011. They led from start to finish winning individual gold as well as Area 3 Team Gold. Joining Devon on the podimum was Libby Head, Emily Renfroe and Sara Kamensky. Congratulations to Area 3 and Coach Kyle Carter. I have not had a chance to add a 2011 Foal page, so thought I would use FaceBook as a temporary solution. I will add the links below. It is just so easy to upload and share that i have been using it for news a lot lately. 2011 Foals Foaling season for our breeders is complete with 10 fillies and 8 colts. A total of 11 purebreds were born (6 of them fillies). Extremely pleased with what i have seen from the entire foal crop (2009-2011). With 32 foals on the ground (wow, is that for real???) we are finding most important, consistency in temperament but also a very nice top line with a well balanced frame. As to movement, with all of them under the age of 2, it is hard to tell, but having a yearling myself, and seeing a few others in person or video, I like what I see. Time of course will tell on the whole package including performance. I must say though, hearing feedback from very happy breeders is the most satisfying part of this whole venture. I took these before coming to Kstan a month ago so I could get my fix of pony in the first two weeks of being away. These are so classic Connemara and it worked. Everytime I needed a smile I clicked on these. Hope these make you smile too! A Is it really Spring? The winter was tough with half of it spent out of the country and things just didn't go as originally planned. Trying to keep three upper level eventers and one "up and coming" young horse going, and in competition shape, with this crazy schedule is next to impossible. 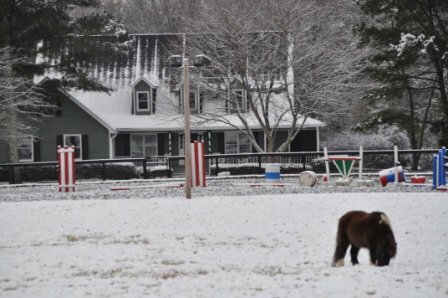 Add to it Community College for Devon and pretty darn bad weather, and the result was that we had to let one of the horses have the winter off. So it ended up being Art. He is so young for what he has accomplished and we figured with the breeding season coming on, it would be a good thing for him. Dan needs to continue his program, and Monte is coming back in amazing form, and Bono keeps amazing us. There is "new" video of Bono on his page from January, but he has made leaps and bounds of progress since then and is going Training now. He really "gets" it and seems to really enjoy it too, making for a great competitor. Hope everyone is enjoying their Spring! As with the rest of the world (ironically except here in Kazakhstan), wintery weather hit hard after the New Year. Devon started the season in Ocala with a great show and another first for Bono in a large and very competitve Open Novice division. He is growing up quickly and teaching Devon a lot. She ran Art bc Dan had to stay home due to a "hot nail" and they had a great go in the JYOP division. We are looking forward to spending February in Florida.